Steyning got back to winning ways in Division 3 West on Saturday as they overcame local rivals Slinfold. Captain Luke Chapman’s team, who slipped to a first defeat in five matches last time out, were convincing five-wicket victors in a clash at near neighbours Slinfold. Andy Isaacs (4-52) and Oliver Collins (4-24) put the squeeze on Slinfold as they were all out 171 after choosing to bat first. Steyning had a slight wobble in the reply, falling to 74-4 and 95-5, but an unbeaten sixth-wicket stand of 79 between Gary Hunt (40 not out) and Johnny Burfiend (39*) saw their side to a third win of the season. Skipper Chapman was pleased to see a victory chalked up and said: “We were very happy to get back to winning ways. “I thought as a bowling unit we were superb. We created a lot of pressure, which Andy (Isaacs) and Ollie (Collins) took full advantage, taking four wickets each. 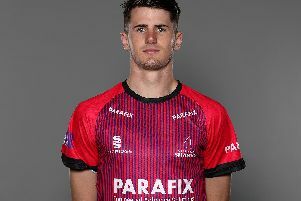 “We spoke about not letting Slinfold get away from us and it was very pleasing to take regular wickets and to bowl them out for 171 was a superb effort. “It was slightly frustrating to lose wickets the way we did as all the batsmen got starts, it was a shame one of them couldn’t go on and get a big score. Slinfold made a steady start after skipper Jonathan Hughes chose to bat first. Innings top-scorer Nabeel Nilamdeen (43) and Cameron Scott (20) shared a second-wicket partnership of 46 to get the home side to 72-2. Isaacs (4-52) and Collins (4-24) ripped through Slinfold’s middle and lower order - taking eight of the wickets to fall between - as Hughes’ team were all out for 171 in 49.3 overs. Openers Christopher Barnett (20) and Isaac Tidley (17) both made starts but failed to kick on for Steyning. Number three Collins (17, Thomas Chalmers (ten) and Sam Hunt (eight) all fell to leave the visitors in danger at 95-5. The fall of Sam Hunt brought Burfiend in to partner Gary Hunt and the pair saw Steyning home. Gary Hunt (40*) and Burfiend (39 not out) batted sensibly to get their side to 174-5 off 43.3 overs. Next up for Steyning is a trip to leaders and rivals Goring but it’s a challenge captain Chapman is relishing. He said: “We will be looking to take this momentum in to next week when we play Goring away.